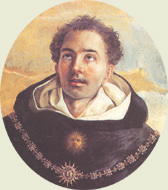 As we have covered in the past (e.g., here and here), The Aquinas Institute has undertaken the project of publishing a Latin/English Opera Omnia of the Angelic Doctor in approximately 60 hardcover volumes. The progress has been impressive so far: the Summa Theologiae; the Pauline Commentaries; the Matthew and John Commentaries; the Job Commentary. All of these books, due to their high-quality texts and bindings and their comparatively low cost, have now become standard go-to editions for teachers, students, theologians, philosophers, and general readers. After years of work under an NEH grant, The Aquinas Institute is happy to announce that the edition of Book IV of St. Thomas's early masterpiece, the Scriptum super Sententiarum or Commentary on the Sentences of Peter Lombard, is starting to be available in print, with volume 1, distinctions 1-13, just released. If you order this book directly from The Aquinas Institute, you can get it at a 50% discount (more on that below). Also worth of note is that the Latin edition of the Scriptum that is printed in this volume (and that will be used for all the volumes of the Scriptum) is derived from the classic Mandonnet-Moos volumes and corrected against the not-yet-released critical edition of the Leonine Commission, with whom the Aquinas Institute is collaborating. That feature makes these volumes the best Latin editions as well as the only English editions. To take advantage of the sale, visit The Aquinas Institute website. The Aquinas Institute is well under way with Books II and III, with a new NEH grant. Other works will appear from time and time. Their publication will be duly noted here and at Thomistica.net. Here are some photos of the new volume of the Opera Omnia.